It’s all about boys and their toys, a wise defence journalist once told me. He is quite right as well – after my first I/ITSEC in Orlando I have a new appreciation for all the cool gadgets and new devices that are available to militaries and government agencies across the world. As I work my way through the exhibition calendar for the first time, slowly getting close to ticking off all the big exhibitions, I can say that I/ITSEC is certainly one that stands out for many reasons. Firstly has to be the clear overlap between the military training and the gaming industries; so many of the products are a result of gaming geeks realising their tech can be used for more than just commercial purposes. Two things that caught everyone’s eye were the Omnideck 6 and the Virtuix Omni. Both demonstrating that it’s not just air force pilots that have the fun kit available to train on. 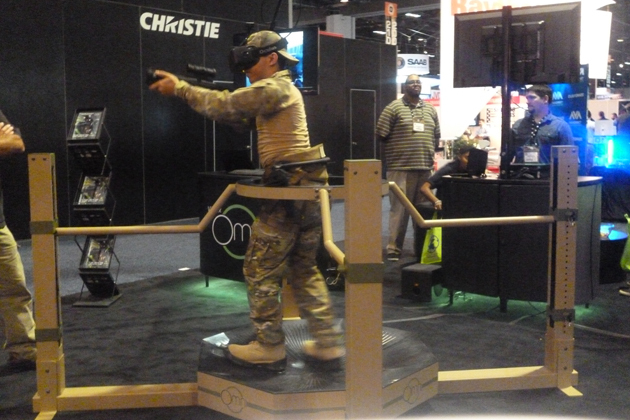 The Virtuix Omni demonstrates the cross-over between the gaming industry and the military simulation market, as the product was originally designed for commercial use alongside games such as Call of Duty, Grand Theft Auto, Skyrim and Minecraft to name but a few. Secondly, the exhibit is in Orlando, one of the more bizarre places to visit during December. I still cannot get my head around listening to White Christmas by Bing Crosby in 25˚C heat, or 77˚F for the Americans among us. However, Orlando is clearly the centre for simulation and training, the Silicon Valley of the simulation world according to some. This is evident after taking a trip to the Lockheed Martin demo centre, which was opened two weeks ago, to show off their F-35 trainer among other things. Finally, I’ve never been to a show with so many half days. Of course this is to allow for the conference to take place alongside it, but not opening the exhibit hall until 2pm on the first day is a much more civilised way of going about things. The focus Tuesday on morning is always the Flag Officer Panel where this year, unsurprisingly, budgets were one of the main topics of conversation alongside the changing nature of training in a the post-Afghanistan era. Emphasis was on the need for training to be much more complex now that the nature of warfare and humanitarian assistance is changing from one main focus area to many smaller ones across the world. The need for reliable, portable, and cost-effective solutions was present as it is at every exhibit I’ve been to so far. Overall, the show seemed to be successful, most commenting that although the quantity of visitors may not have been what it once was, there was certainly a better quality of attendees. Although the show is situated in the US, some commented how I/ITSEC is better for them to catch up with their international customers. Indeed, talking to exhibitors across the four days there weren’t many negative things to be said about the attendance of the show. All the big players in the industry arrived, including Lockheed Martin, General Dynamics, CAE, Cubic, SAAB and Northrop Grumman, showing off their latest innovations. However, in my opinion, it’s sometimes the smaller companies that often leave you walking away thinking ‘wow, that’s a pretty cool piece of kit’, which is what it is all about at the end of the day.